KILLINGTON—Bear Mountain’s Stash Park will be home to a two-day benefit banked slalom event to bring the East Coast snowboarding community together. Being held Saturday and Sunday, March 11 and 12, snowboarders will gather at Killington Resort’s “The Stash” terrain park to take advantage of the natural terrain and all the creative elements the mountain has to offer for a great cause. Saturday’s event is open to all snowboarders and will be timed individually. The action continues on Sunday with a Shop Team invite-only banked slalom event. Shops will enter teams to compete for the Slash & Berm Banked Slalom title. The 2017 Slash & Berm Banked Slalom benefits the High Fives Foundation. Founded by Roy Tuscany, the Tahoe-based organization is dedicated to supporting the dreams of mountain action sports athletes by raising injury prevention awareness while providing resources and inspiration to those who suffer life altering injuries. Registration is open to snowboarders only. Pre-register online at killington.com. Registration is $50, and includes lift ticket, lunch, and competitor jersey. Pre-registration closes Thursday, March 9, at 5 p.m. If spots are still available, day-of registration will take place from 8-9:30 a.m. on the 3rd floor of Bear Mountain Lodge. Day-of registration is cash or check only. No registrations will be taken after 9:30 a.m.
2016-17 Killington season passholders receive a discounted registration available through the online registration page. Please note that with this discount, participants will not receive a lift ticket. All participants must fill out an Express Assumption of Risk form. Those under age 18 will need a parent/guardian signature. Registration for Sunday’s team event is invite only. 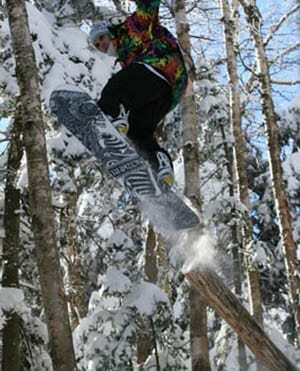 For more info, visit killington.com. A snowboarder hits a feature in the Stash terrain park.